I created this website to share what I have learned about the pursuit of sustainability. What is working? What has the potential to work even better? To supplement this website, my blog www.mariposapaulette.com includes stories about people and their actions that make a difference. In addition, I love to share what I have learned through public presentations and workshops. See the links to your left. I am a Michigan State University professor, writer, and concerned citizen. During my travels in Mexico, Ecuador, Guatemala, Nicaragua, England, Cuba. Tanzania, and beyond, I have learned about grassroots tools including Fair Trade, direct trade, cooperatives, local production and purchasing, organics, and micro-finance. My work with Spartan Global Development Fund (SGDF) is central to my passion for making a difference in the world and my role as a teacher at Michigan State. We founded the Registered Student Organization (RSO) on July 4, 2009 with four twenty-five dollar contributions to loans on KIVA.org. Two years later, we launched our 501(c)(3) non-profit organization. And, as of 2019 we are celebrating ten years of work with small entrepreneurs. We are focusing our lending now on work in Guatemala with our field partner, As Green As it Gets (AGAIG). And, as of 2019 we have made over $101,000 in loans with an over 99% repayment rate. Our efforts are sustainable - and our work expands. See www.spartanglobalfund.org to learn about SGDF. First we must dream of living in more sustainable ways and educate ourselves about the means to do so. Then each of must take action. No one can do everything, but each of us can do something. Thank you for joining me in doing something in ways that stem from your heart and passions..
Spartan Global Development Fund (SGDF): SGDF raises funds for microloans for small entrepreneurs in the United States and around the world. I serve on the board of directors for its companion 501(c)(3) non-profit organization. Please visit www.spartanglobalfund.org. Students Today, Leaders Forever: The MSU chapter of STLF works to engage students leadership through community service projects in the Lansing/East Lansing area throughout the academic year and across the U.S. during spring break. In March of 2016 we will be sending three busses around the country full of MSU students who are paying their own way and donating time to make a difference in communities across the United States. We one of the most active chapters in the U.S.! Please visit www.stlf.net . 2018: Guatemala with our Spartan Global Development Fund members to meet with recipients of microloanand update research on microfinance, direct trade, Fair Trade, and cooperatives in Guatemala. 2016: A trip to Tanzania on a team to explore the potential for microfinance projects in the rural village of Naitolia in northern Tanzania. 2015: Havana, Cuba to study sustainability and community development as the U.S. and Cuba reestablish diplomatic and trade relations. 2014: Quebec, Quebec for an international forum on cooperatives. 2014: Minneapolis, Minnesota to study cooperatives. 2013: Madison, Wisconsin to study cooperatives. 2012: Guatemala to study Direct Trade, Fair Trade, and microfinance. 2010: Chiapas, Mexico to study Fair Trade, cooperatives, and organics. 2010: Traverse City, Michigan area to study organics, Fair Trade, microfinance, and local production. 2009: England to lead workshops at Coventry University's International Youth for Fair Trade conference and serve as a delegate to a Fair Trade conference at Oxford University. 2008: Ecuador to study perspectives of indigenous people on Fair Trade, industrialized agriculture, and sustainability. 2007: Nicaragua to study Fair Trade, DR- CAFTA, and the Meso-American Development Plan. 1997 to 2006: Multiple trips to Mexico for research on sustainable development and to lead study abroad groups to study environmental law and business in Mexico. 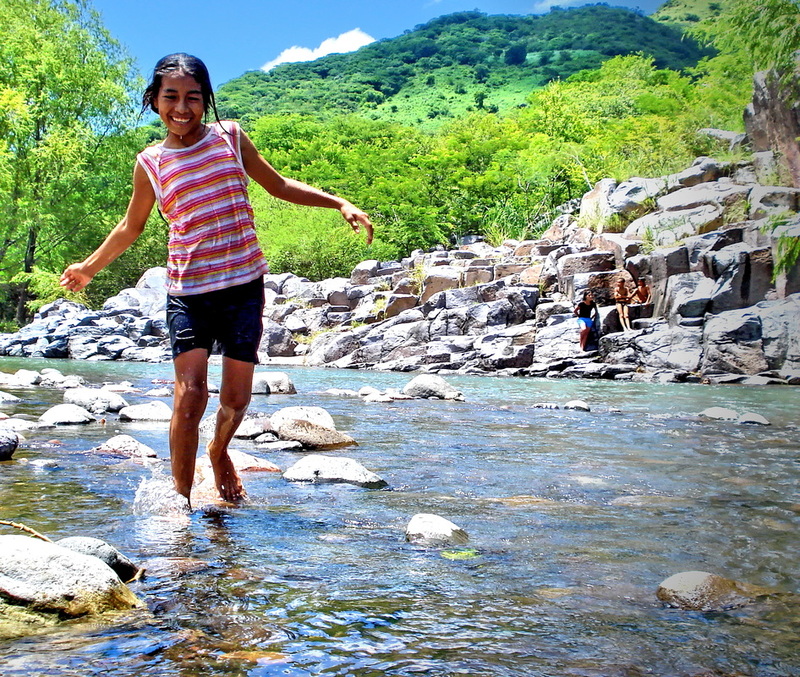 This is Jessica YaJaira Blandón Díaz on the San Juan de Limay River near Nicaragua's northern border. Her father is a carver of marmolina (soapstone -a stone related to marble) and a member of a Fair Trade cooperative. Fair Trade gives Jessica's family income to pay for her books and uniforms, enabling her to continue her studies in the local public school.